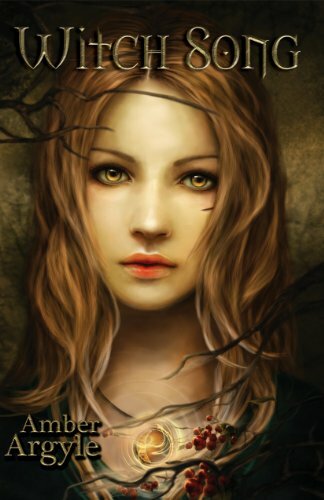 Witch Song tells the story of Brusenna--who later renames herself Senna--a young, untrained witch that leaves behind her old life and everything she thought she knew in order to save the witches that have disappeared, including her mother. Senna is the last witch left, and their only hope. Having been ostracized by the people in her village her whole life, Senna is surprised when Joshen, a boy only a few years older than her, wants to help her on her quest. From there, the danger only gets worse as Senna comes closer and closer to facing off against the Dark Witch that is holding the others prisoner, and restoring the seasons to their natural order. Witch Song is a great high fantasy book, one that I really enjoyed and read in only one sitting! Amber Argyle had a very eloquent writing style, bringing the imagery to life with vivid descriptions and fantastic world building. The concept of the witches and how their magic works is definitely one of a kind. The witches have power over the Four Sister: Earth, plants, water, and air. They can control these elements by using their Witch Song. A witch's singing voice is her most powerful weapon. I loved Senna, although there were times that I wanted to smack her for her ignorance. When she realized what needed to be done, even if she didn't know how to do it, she stepped up and found a way. Joshen is my new YA crush! He's loyal and refused to leave Senna's side, even when she pushed him away. Such a sweetheart! There was a certain part, not yet the ending, but getting there, that I felt was rushed too much. Like, the entire novel was building up to that moment, Senna was preparing herself for that confrontation, and then boom, it's over. That's my only issue, and even then, it's not that big of a deal. Everything wrapped up nicely, despite that rushed part, so I really have no qualms about it. If you're looking for a great fantasy read, with nonstop action and a sweet romance, then I recommend Witch Song wholeheartedly. I give it 5 out of 5 stars! Sounds great! Something I'll definitely have to look into.